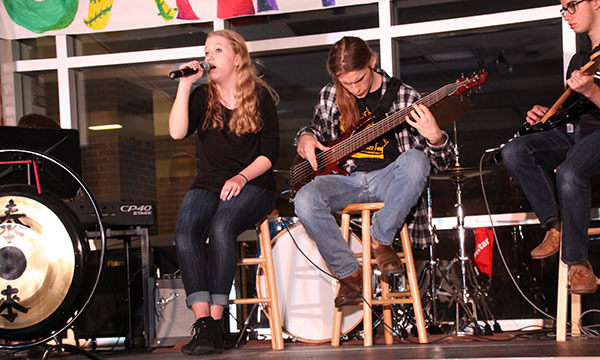 Mindful music: Playing on stage, junior Megan Heublen, sophomore Jack Sundstrom (left) and junior Jack Quinones (right) perform at Jamnesty, April 13. The students contributed to the show and to peace week, raising awareness and playing music. On April 13, Amnesty International and STAND for Peace (STAND) hosted their annual Jamnesty event, capping off STAND’s Peace Week. According to STAND sponsor Matthew Whipple, Jamnesty puts live music, dance performances, slam poetry and activism all under one roof. The activism portion of Jamnesty comes from the event’s overarching goal, raising money to split between STAND and Amnesty International’s causes. According to Whipple, STAND’s donations go towards putting Purity, a girl living in Kenya, through high school, while Amnesty International’s portion of the money goes to refugee programs. The show resembled a mini version of V-show, except looser in structure, according to Whipple. Whipple explains that Jamnesty’s lack of a theme allowed for more creativity and students’ ability to make the event whatever they wanted. Expanding on the topic of flexibility, senior Katie Woodrick, who performed a poem entitled “Swingset” by Andrea Gibson, appreciated Jamnesty’s low level of commitment, allowing more students, including herself, to take part. For Woodrick trying out for Jamnesty was a spur of the moment decision. Coinciding with Jamnesty’s focus on important issues, Woodrick explains why exactly she chose the poem she did. According to Woodrick, “Swingset” by Andrea Gibson focuses on the underrated importance of childhood innocence, and in Woodrick’s eyes, it’s a message students needed to hear. Junior Miracle Josaiah’s poem entitled “The Average Black Girl” had a message that she felt was essential for the GBS population to hear too. Josaiah explains that the poem’s focus on racial stereotyping is a message that can bust the Glenview bubble. According to Josaiah, the poem pushes the idea that the we are all different, but Glenview brings us all together. According to senior Sam Hicks, who performed “I’m Yours” by Jason Mraz and “Right as Rain” by Adele, a large element of any performance is the happiness you evoke from the audience. As she performs, she loves seeing the reaction from the crowd. “I see people smiling, and it makes me happy to see that people are actually enjoying the music,” Hicks said. As the show came to a close, Whipple hopes that students left feeling like they had a good time, but most importantly, he hopes they left feeling informed and empowered. According to Whipple, students, as individuals and as GBS’ community, have the potential to impact the world.